Borrowing a '93 Suzuki Ćino to take on a road trip from Sydney into Australia's outback might not be the most advisable adventure vehicle, but for us it was the best option we had. And whilst we never made it into Mungo National Park, we spent more time and experienced more of the outback than we would have otherwise planned. Adventuring locally to fulfil our artistic pursuits has lead to many intimate nights with Google Maps, researching the nooks just beyond Sydney’s backyard that piqued our interest. One such nook was Mungo National Park, which lies 13.5hrs drive directly west from our studio, nestled in the outback near the New South Wales, Victorian and South Australian borders. Famous for being the resting place for some of the oldest human remains in the world and for its eroded lunar landscapes, this isolated park, surrounded by the Mallee scrublands was the destination of our last casual adventure. The Mallee is an ill-defined area of Australia's interior, spanning over the country's lower south western states. Once covered by an inland sea it was the place where we occupied ourselves as we waited out the flood waters that had rendered Mungo's roads undrivable. This unplanned and extended sojourn was courtesy of the late spring rains that had flooded NSW's interior roads, causing us to be re-routed and live the cliché; 'it is the journey that matters, not the destination.’ This was what we tried to convince each other as our week road trip slowly extended to 10 and then 12 days as we called the local road infoline daily in the hope that the roads to Mungo would be re-opened. Finding the Lake Mournpall campsite the optimum distance to Mungo (should the roads re-open) and far enough away from the dreariness of Mildura we pitched our tent and committed to a spending time deep in the Mallee bush. The word Mallee is an Indigenous name given to the groups of eucalyptus that vegetate and create its sparse scrappy landscape. These trees are known as the 'Icebergs of the Outback' as the slender branches of the tree stem from its immense lignotuberous trunk growing beneath the earth's crust. This unusual growing structure is a survival adaptation with its water holding capabilities sustaining the tree in drought and providing underground protection against bushfires should the above ground foliage of the eucalypt perish. Mallee Ringneck parrots, baby Noisy Miners and melodic Butcherbirds populated the trees around our campsite. Lake Mournpall was marked as a birder's haven to spot the tiny Emu Wren and endangered Mallee Fowl. 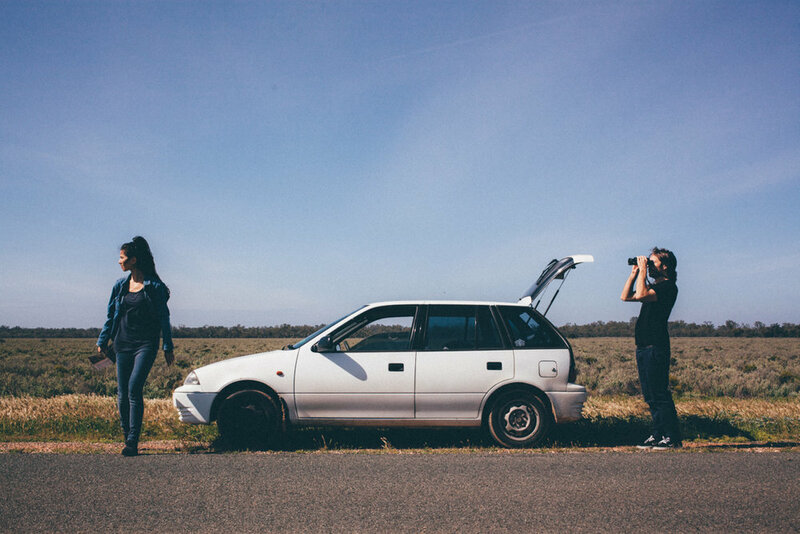 We embarked on a dusk expedition into the surrounding lands to scout these two specialists of the Mallee terrain. Our hours of bird watching proving futile as the spring rains had pooled across the plains thus the wildlife did not have to converge around the lake to quench their thirst. Instead we found the Mallee filled with intimidating emus, kangaroos, endless dust covered scrublands and void of much else. After returning to camp, our skin streaked by our sweat and schnitzeled by dust, we set about to prepare our standard campside dinner. Perhaps we were overly optimistic by the supplies we had picked up - our search for sourdough bread, Comté and tomato relish in Mildura proving as successful as our birdwatching efforts - as we sat by the fire and ate what essentially tasted like toasted white bread, plastic cheese and tomato sauce. We turned in for the night, the drones of the local froglife reverberating over us as we settled in to sleep surrounded by a eucalyptus covered wasteland so far from home. Later at home, reading over the observations of the Mallee's early explorers, it appeared the same sentiments remained from those who had passed through these wildlands 200 years before us. The harsh repetition of the ochre burnt landscape punctuated by the native scrub created a landscape of beautiful desolation. Its isolation, whilst confronting, also providing an unusual freedom and relief as you were enveloped by the surrounding Mallee stillness. It is a silent place and a hot one. However when a breeze should pass, it crashes through the trees, sending a melodic howl crying through the leaves, conjuring up the sounds of waves breaking over the plains of this once ancient inland sea. We had said farewell to the Mallee and were already half a day into the drive home when we received word that the roads to Mungo had re-opened (but only for experienced 4x4 drivers and vehicles). We sped back the way we had come and against better judgement, we booked a local tour, rationalising that out of anyone a professional tour guide with a purpose built adventure car would be able to get us into Mungo National Park. Our instinctual wariness of tour guides proved right as after 2.5 hours of driving and a mere 45km from the entrance to the park we were forced to abandon this final attempt as our guide decided the road was too muddy for his new 4WD to continue. The next morning, we made peace with the fact that we were never to set foot into Mungo and we began the long journey home, driving our little adventure vehicle under the limitless outback sky, bidding the Mallee farewell for good.